The ADV611 ADV612 are low cost, single chip, dedicated func- tion, all-digital-CMOS-VLSI devices capable of supporting visually loss-less to 7500:1 real-time compression and decom- pression of CCIR-601 digital Video at very high image quality levels. The chips integrate glueless Video and host Interfaces with on-chip SRAM to permit low part count, system level implementations suitable for a broad range of applications. The ADV611 ADV612 are 100% bitstream compatible with the ADV601. The ADV611 ADV612 comes in a 120-lead LQFP package. The ADV611 ADV612 are Video Encoders decoders optimized for closed circuit TV (CCTV) applications. With the ADV611 ADV612 you CAN define a portion of each Video field to be at a higher quality level relative to the rest of the field. This quality box feature significantly increases compression of less impor- tant background details, while retaining the images overall context. Additionally, the unique subband coding architecture of the ADV611 ADV612 offer many application-specific advantages. A review of the General Theory of Operation and Applying the ADV611 ADV612 sections will help you get the most use out of the ADV611 ADV612 in any given application. The ADV611 ADV612 accept component digital Video through the Video Interface and outputs a compressed bitstream though the Host Interface in Encode Mode. While in Decode Mode, the ADV611 ADV612 accept compressed bitstream through the Host Interface and outputs component digital Video through the Video Interface The host accesses all of the ADV611 ADV612s control and status Registers using the Host Interface Figure 2 summarizes the basic function of the part. By Analog Devices, Inc. 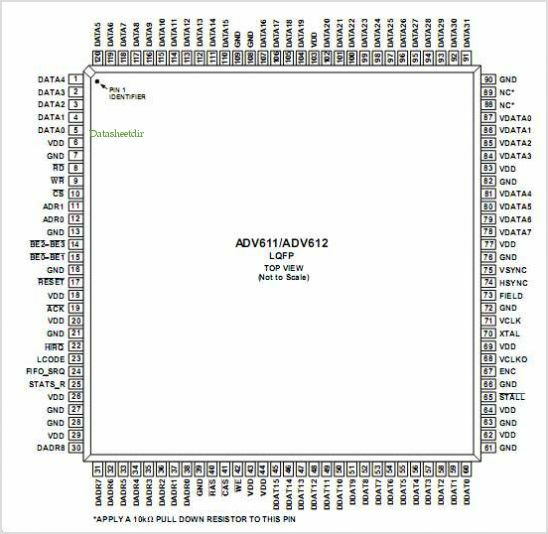 This is one package pinout of ADV611,If you need more pinouts please download ADV611's pdf datasheet. ADV611 circuits will be updated soon..., now you can download the pdf datasheet to check the circuits!